We tend to go out every Friday night with friends. We decided this year we would make more of an effort to eat some meals at home like we used to – making recipes as a group and trading off hosting/houses. 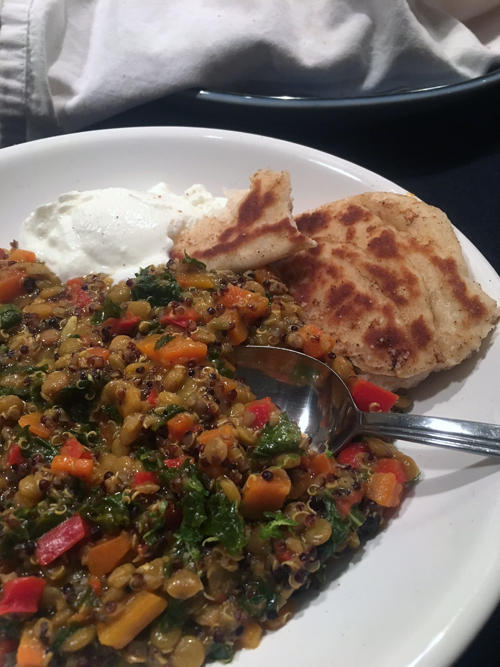 I received a text from my girlfriend Michelle with a link to Half Baked Harvest’s – Simple Coconut Quinoa and Lentil Curry with Lime Mango asking what I thought about trying to make it on a Saturday, since it was a little too involved for Friday after work. It sounded good to me, but I knew it was going to be a VERY hard sell to Dan. I knew for sure the Greek yogurt would be a “no go” and team that with the kale, quinoa and lentil “way too healthy” trifecta and I pictured stopping at McDonald’s on the way there. I was wrong. I showed him the recipe and he agreed to give it a try… so off to the store Michelle went. The dish was very ingredient heavy, but it was worth it for sure. If you want to see gorgeous food photography, head over to the linked recipe post. I’ve got iPhone photos here because I wasn’t even sure I was going to post about this. The photos I took were just for my own reference…then I tasted the dish and wanted to share with everyone on planet Earth. Ha-ha. Naan, greek yogurt, fresno chiles + almonds, for topping – we left off the fresno chilis and almonds because we forgot to get them – the almonds would probably be good texturally, but it certainly didn’t need them. Heat the coconut oil in a large heavy bottomed pot set over medium heat. Once hot, add the red pepper and carrots, cook 2-3 minutes or until lightly charred on the edges. (Ours never charred which worked out fine) Add the garlic + ginger and cook 30 seconds. Add the Thai red curry paste and curry powder, continue cooking for another minute or until the curry is fragrant. Slowly pour in the coconut milk, coconut water and soy sauce. Stir to combine and then bring the mixture to a boil. Once boiling, stir in the lentils and quinoa. 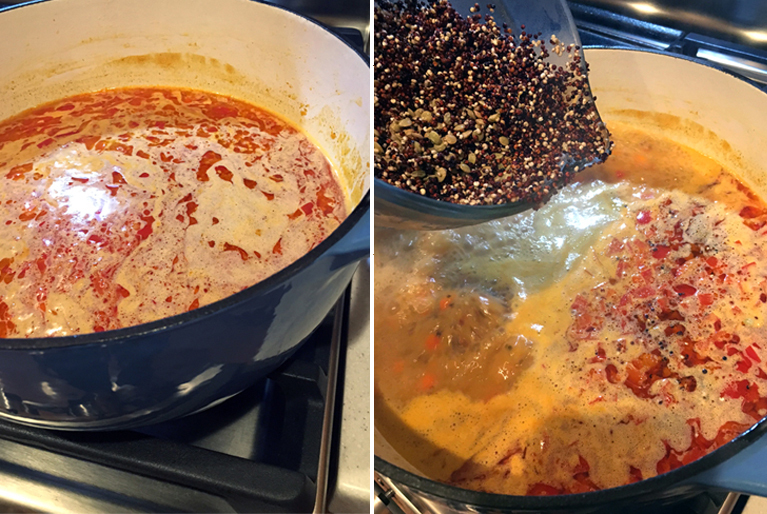 Reduce the heat to a simmer, cover and cook for 20-25 minutes or until the lentils are tender and the quinoa is soft. 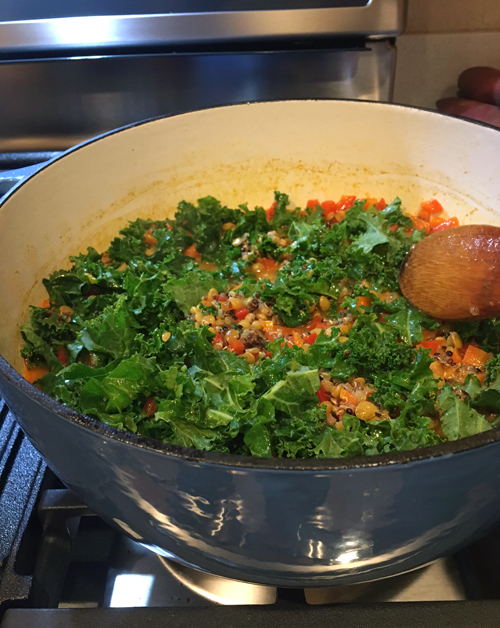 Stir in the kale and continue cooking, uncovered for another 5 minutes. Remove from the heat and stir in the lemon juice + zest, the cilantro and basil. We added a few more pinches of salt after tasting. Spoon the curry into bowls and top with mango. Drizzle the mango with lime juice + zest. 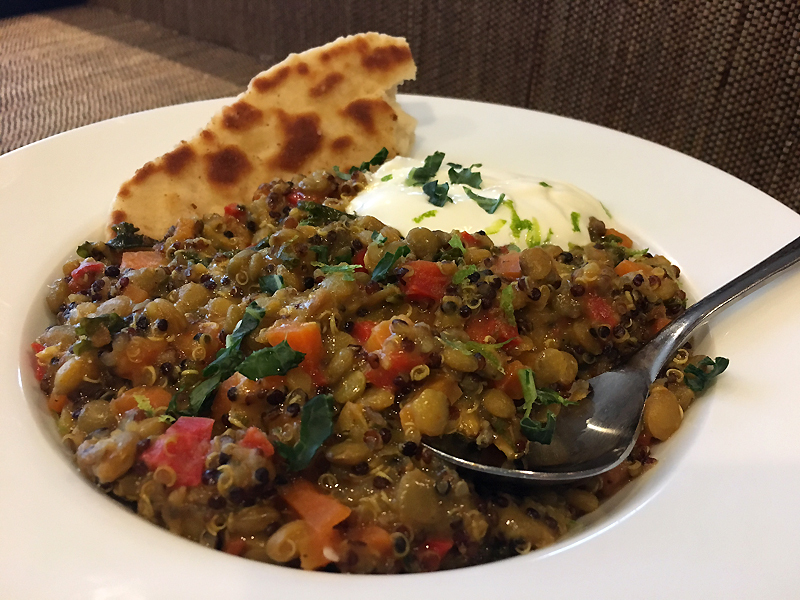 Garnish the curry with a dollop of greek yogurt and serve with fresh naan. This is where you could add the Fresno chilis and almonds. I am happy to report that Dan used his naan to literally scrape the bowl clean. Our version was much less rustic due to dicing the carrots and peppers uniformly and not using fresh basil. It was also visibly thicker than the original recipe – looking at our finished dish compared to the photos on Half Baked Harvest. I really think the less soup-like texture is what sold Dan. It should be noted that I have developed a slight allergy to Mango, so I didn’t add any to mine – the others liked the addition. I took all of the leftovers home and ate it for lunch for 4 days straight. So instead of getting 4 total servings as the original recipe suggested, we got 8 and didn’t change the ingredient quantities. Guessing our portions were smaller. Yay, more room for naan. The curry flavor got better and better as the days went on. It really was the perfect make ahead meal to portion out for lunches. 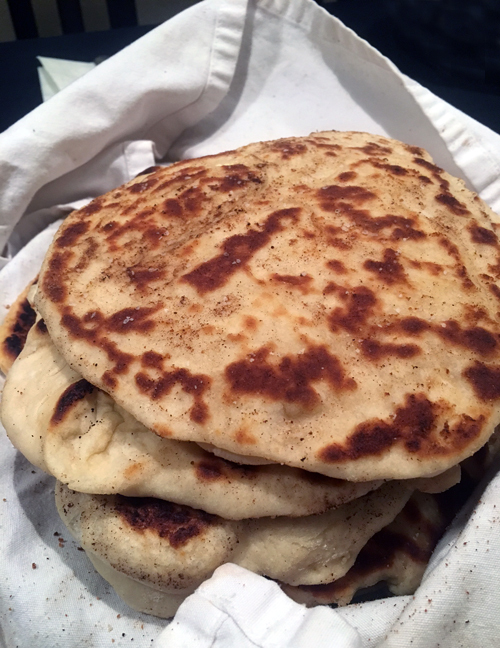 We also followed Half Baked Harvest’s recipe for naan. Making naan was a first for both of us and OMG, it was fairly easy and it tasted so freakin’ good. The leftovers were even good. I used a cast iron skillet to re-heat them. In a medium size bowl, or 4 cup glass measuring cup, dissolve the sugar in the warm water (about 105°F). Add the dry yeast to the warm water and stir until the yeast is dissolved. Let it sit for 10 minutes or until the mixture begins to froth and rise. Add the flour, salt, baking soda and baking powder to a large mixing bowl. When the yeast is foamy and smells like bread, add the warm milk and yogurt. Pour the wet ingredients right into the middle of the dry and begin mixing the wet with dry using a wooden spatula or spoon. When the dough is about to come together, use your hands to finish mixing. As soon as it comes together, stop kneading. It should be sticky, but should form a ball and be soft. Cover the bowl with a damp towel or plastic wrap and let sit in a warm place for 1 hour. When ready to cook, divide the dough into 8 equal balls and using a rolling pin to roll each piece of dough into an oval shape. It should be about 6-8 inches long and about 1/4-inch thick, but no thinner. Repeat this method with the rest of the dough. Warm a cast iron skillet (we used a regular skillet with success) over medium-high heat (you definitely want it pretty hot, but not too hot or you will scorch the naan). Brush both sides of the naan with melted butter and if desired sprinkle on any spices you like such as cumin and garlic. (We didn’t use any spices, just sea salt) Place the naan on the hot skillet, cover with a lid and bake for 1 minute, until you see bubbles starting to form. Flip and cook for 1-2 minutes on the other side, until large toasted spots appear on the underside. Brush with a bit more butter if desired, then sprinkle with salt. Place the naan on a tea towel-lined plate. Repeat with the rest of the naans and serve. Fresh is best, but will keep in a ziplock bag for a few days or in the freezer. 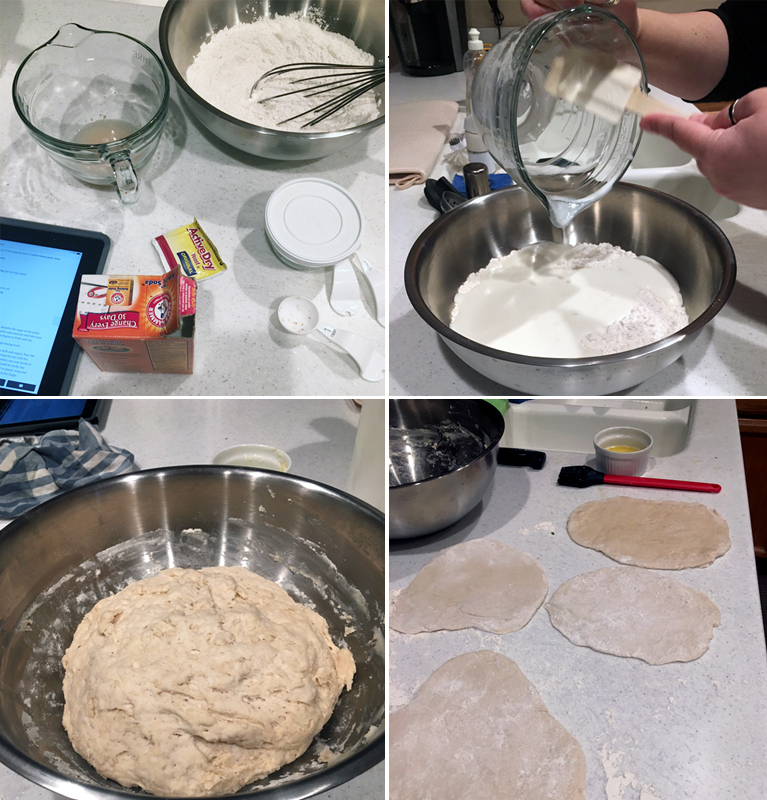 I definitely had a fear of making dough before my obsession with making the perfect at-home pizza. The only thing to consider is allowing enough time to let the dough rise. As I said above, the homemade naan was a total win. Not necessary for the curry recipe, store bought would be fine, but I encourage you to give it a try – it really was easy. It helped to have another set up hands with the butter basting, lid removal, etc. Now that I’ve done it once, I could probably do it by myself next time, it’s just getting the timing down – every cooktop is different. Thanks Michelle for an awesome night and fun cooking adventure. I’m excited to try other things as the weather starts to warm up. My Weber grill needs a workout! 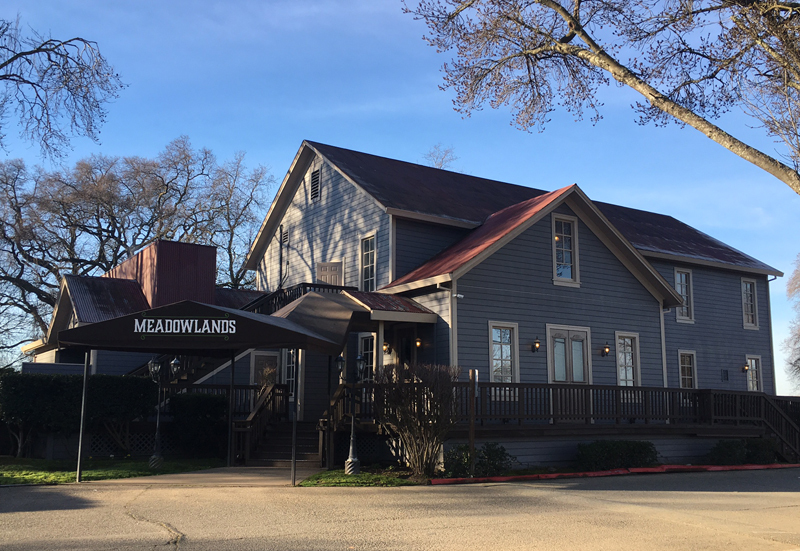 I had been hearing many good things about Meadowlands Restaurant, located at the original Slough House, built in 1850 – off Meiss Road in Sloughhouse, CA. 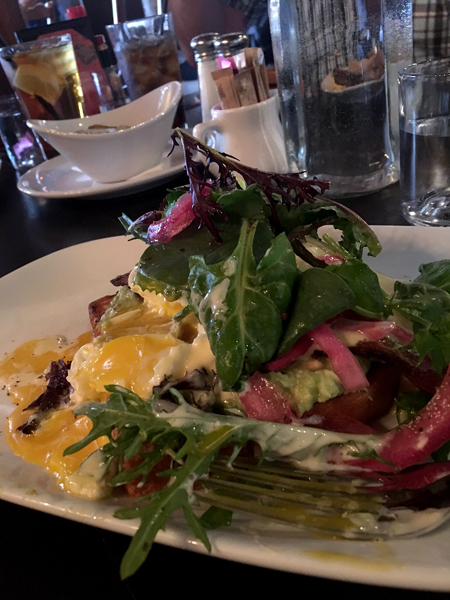 Nobody in my immediate circle of friends had been yet, so when my friend Carolyn suggested getting together for brunch – this place topped my list and she’s always down for a new food adventure. 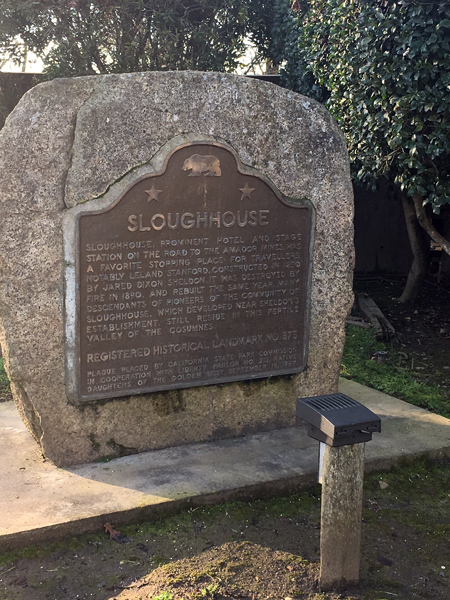 When I first moved to the area back in 1999, we often visited Sloughhouse Inn, one of the previous restaurants in the same location. Over the years there were other failed attempts at re-opening. 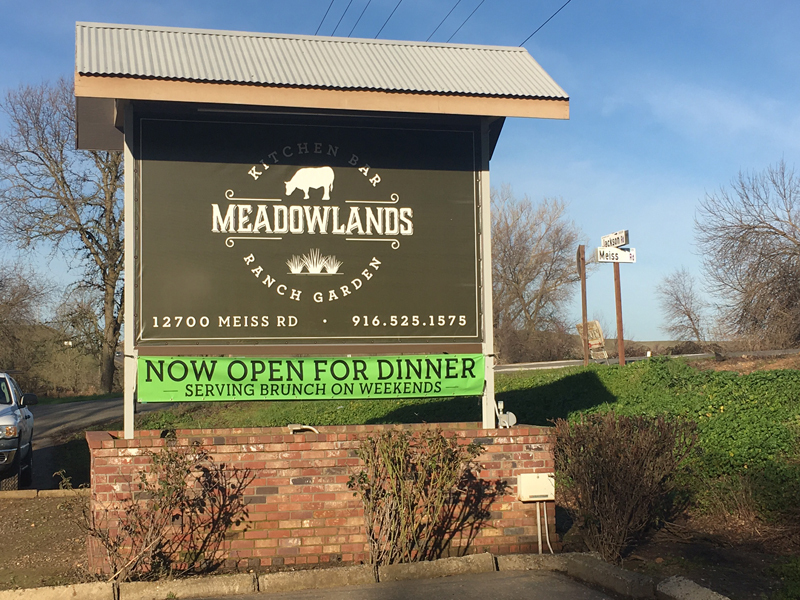 This time around restaurateurs Ron and Terri Gilliland – who also own Lucky Dog Ranch in Dixon and Roxy and Lucca Restaurants in Sacramento, are behind the venture with executive chef Dan Origel in the kitchen. 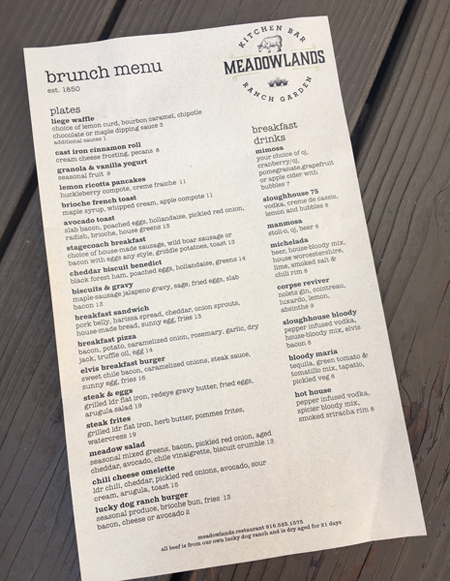 Roxy is another go to brunch place for us and I have enjoyed many amazing meals at Lucca – so I went in very excited to give Meadowlands a try. It was a perfect day for a drive. The massive rains we have been getting in and around the Sacramento area led to some flooding in the restaurant’s parking lot – a common occurrence due to the location. We were happy to see sunshine and clear skies. Carolyn loves all things history and historical markers of any kind must be read. She also likes butts and taking photos of statue butts, we’ll save that post for another day. 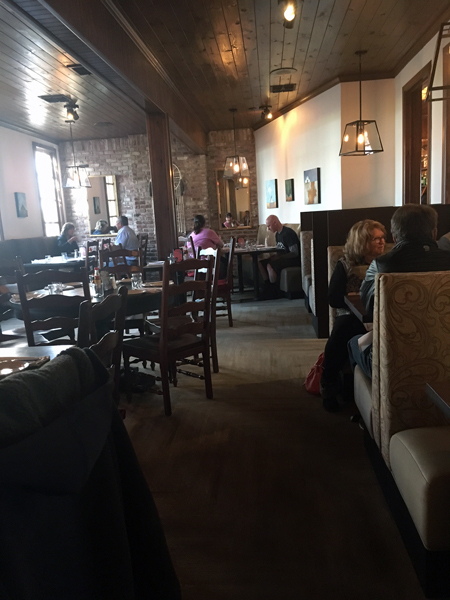 I really liked the simple interior and a good mix of booths and tables is always nice. I’ve been looking for a new dining room light fixture for over the table and had considered the glass and metal Edison bulb look – they had them throughout the main dining area and it made me like them even more, it’s the keeping the glass panels clean that has me concerned… still on the hunt for the perfect light fixture, I’m getting close. We were seated in the darkest table of the entire restaurant. I knew photos would be a challenge, so I made sure to get the menu photo on the outdoor deck. Aaron, Carolyn and Dan are used to me moving plates around for the best lighting option. I swear, I’m a pure JOY to dine with…ha-ha. Thank God I have really great friends that understand my passion for documenting/blogging some of the restaurant meals I eat. Trust me, my everyday eating would put readers to sleep. My daily meals for the most part are boring. I ordered the Avocado Toast. Slab bacon, poached eggs, hollandaise, pickled red onion and radish on brioche with house greens. 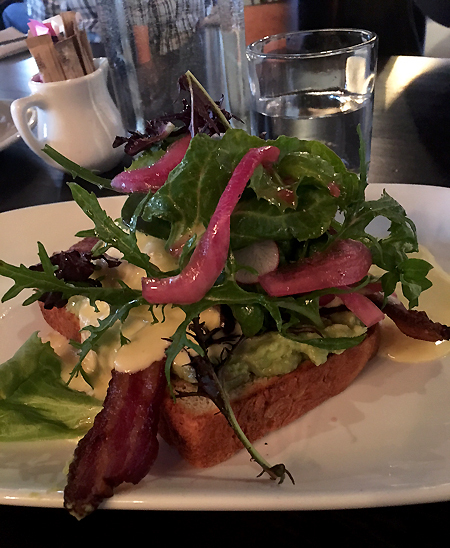 The greens were dressed perfectly – the pickled onion added so much to the dish and I’ve pretty much been living off avocado toast, eggs and pickled everything since. No, I’m not joking. I had to get the breaking into the egg photo… just looking at the photo makes me think – get in my belly! Since our brunch trip was such a success, I’m thinking of switching it up with a visit for dinner next time around. Aaron ordered the biscuits and gravy. 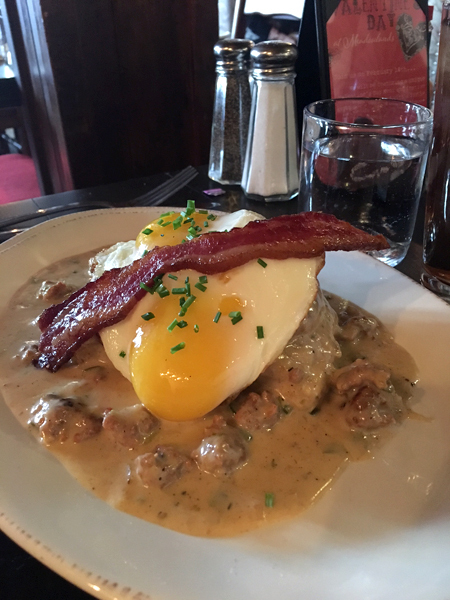 Maple sausage, jalapeno gravy, sage, fried eggs and slab bacon. He also got a side order of breakfast potatoes that I kept stealing. Thanks Aaron! He really liked the flavor profile of his dish, we all really enjoyed what we ordered. 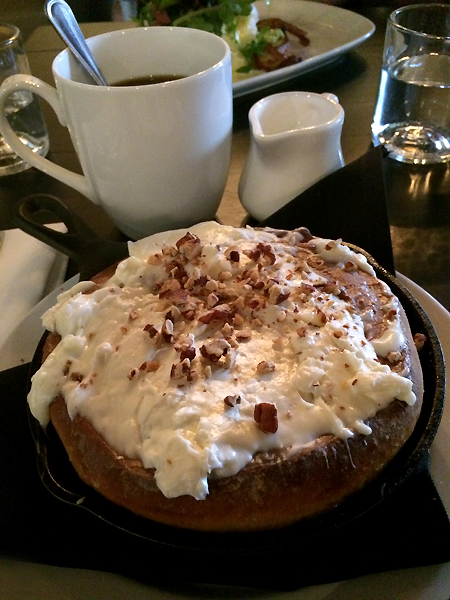 Carolyn decided on a coffee and the cast iron cinnamon roll with cream cheese frosting and pecans. 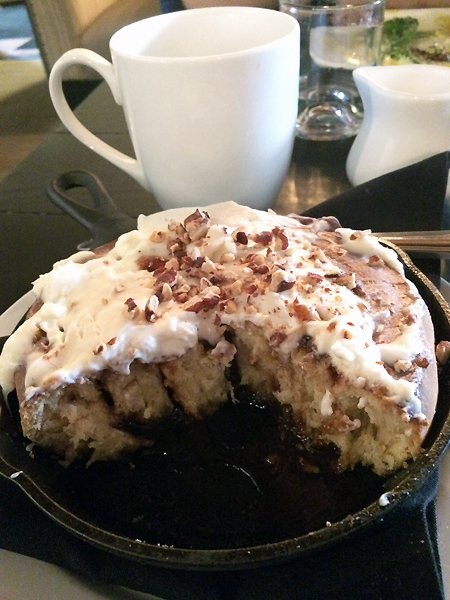 A cinnamon roll the size of your head = sharing and a to-go box for home. It was delicious and the perfect dessert ending to my avocado toast. I haven’t eaten too many cinnamon rolls with cream cheese icing – you know… the Pillsbury canned versions don’t come with the fancy stuff. It was a fun change-up on the norm. I have made cinnamon rolls from scratch before and I also enjoy an occasional Cinnabon version, but I lean towards savory on all things breakfast. I guess that statement is true for every meal and all snacks. I’d much rather eat a bowl/entire bag of chips or a hunk of cheese over a cookie or any piece of candy. 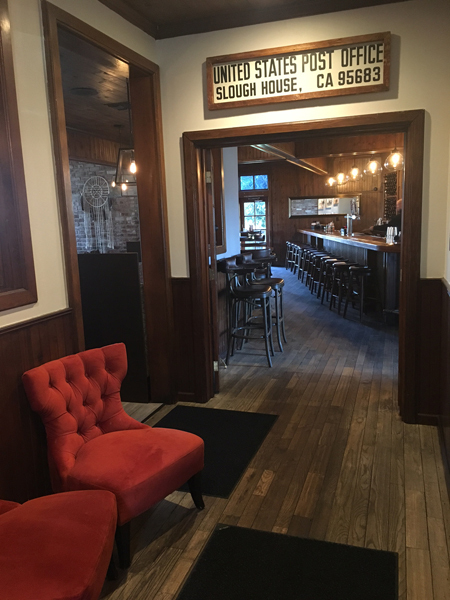 Dan ordered the Stagecoach Breakfast – choice of house-made sausage, wild boar sausage or bacon with eggs any style, griddle potatoes and toast. I failed to get a photo of his plate, but he gave it a thumbs up as well. 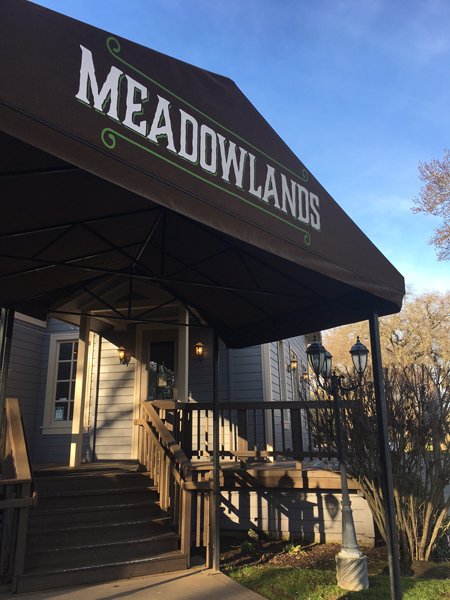 Meadowlands serves their our own pasture raised beef, fruits & vegetables from their gardens and Davis Ranch, conveniently located right off Jackson Road. I saw on Facebook that they are searching for local bands to play during the Summer – a cocktail, some tunes and patio dining, now that sounds amazing. I’m already looking forward to my next visit. 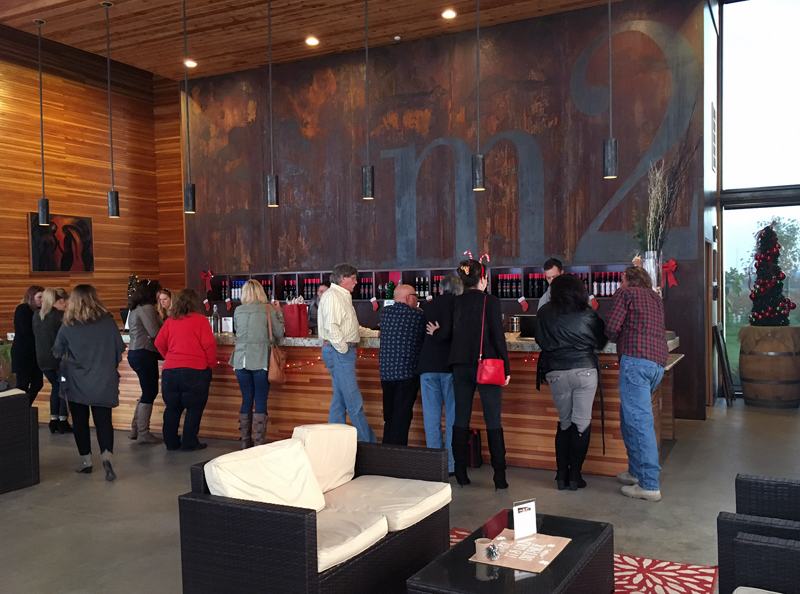 One last stop on our holiday home tour was visiting one of Wendy’s favorite local wineries – m2. Wendy and her husband belong to the m2 Cellar Dwellers Wine Club and she had a few bottles to pick up. 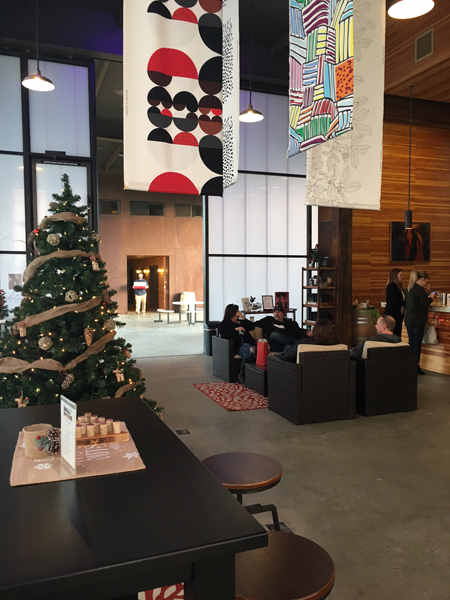 The winery and tasting room are located at 2900 Peltier Rd. in Acampo, CA. We arrived an hour before closing and it was the perfect way to end a fun day with friends. I loved the industrial look of the building. 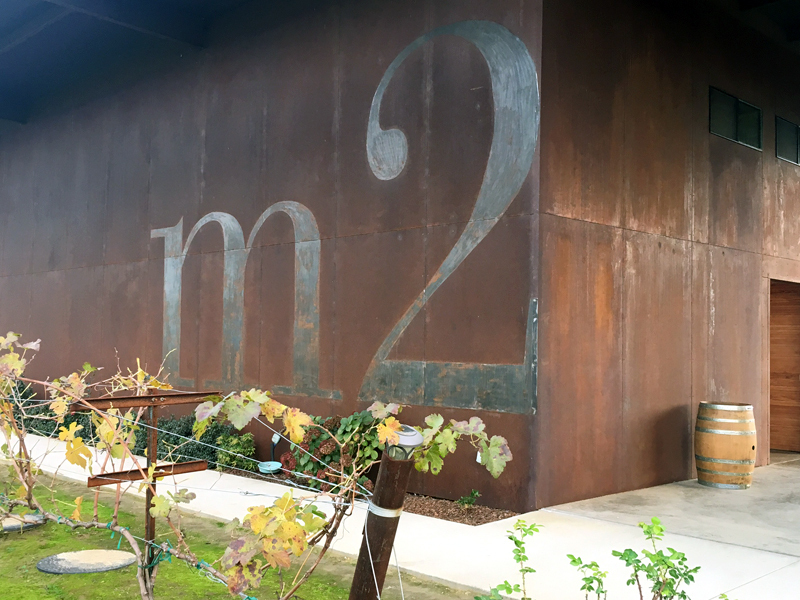 m2 creates artisanal wines from vineyards in Lodi, Napa, and the Sierra Foothills of California. According to the m2 website, their first wines were crafted in 2004. 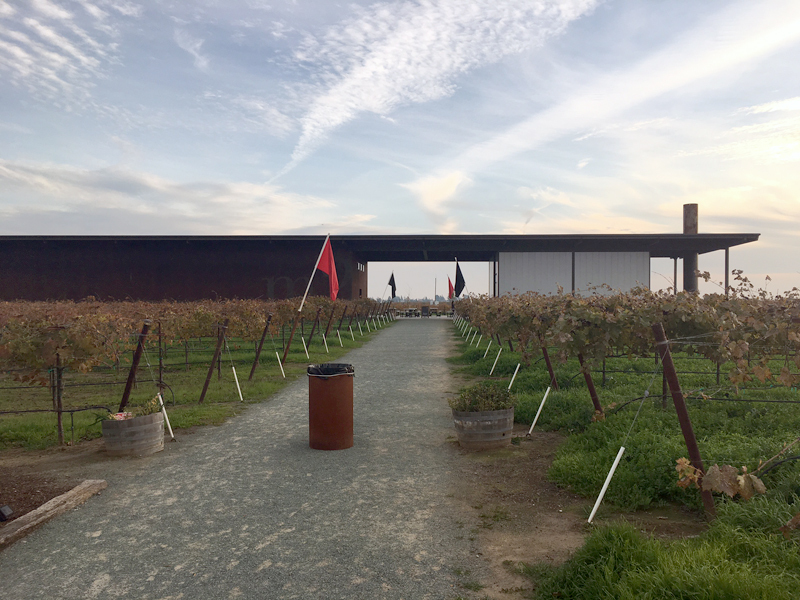 In the fall of 2006, they opened their original winery and tasting room in an industrial park in northeast Lodi. 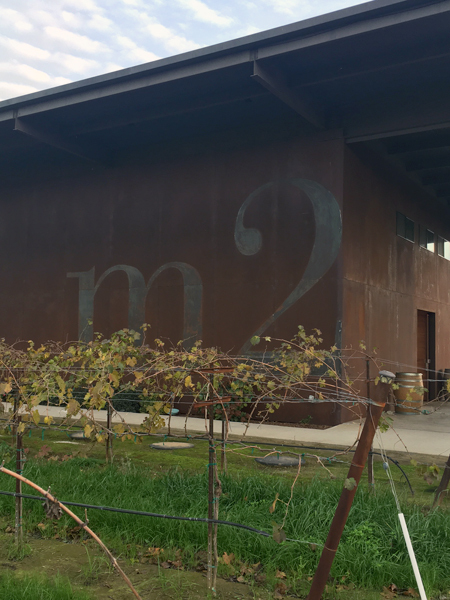 They quickly outgrew that space and opened the new winery and tasting room in January 2014. I never saw the old space, but I really was impressed with the new space. Groups of 10 or more are by reservation only. 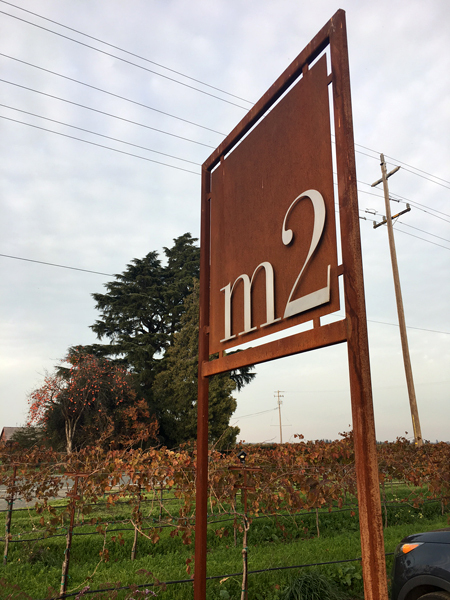 m2 also hosts winemaker dinners and summer concerts that would be really fun to attend. The graphic designer/typography geek in me loved the scale of the lettering on the side of the building. 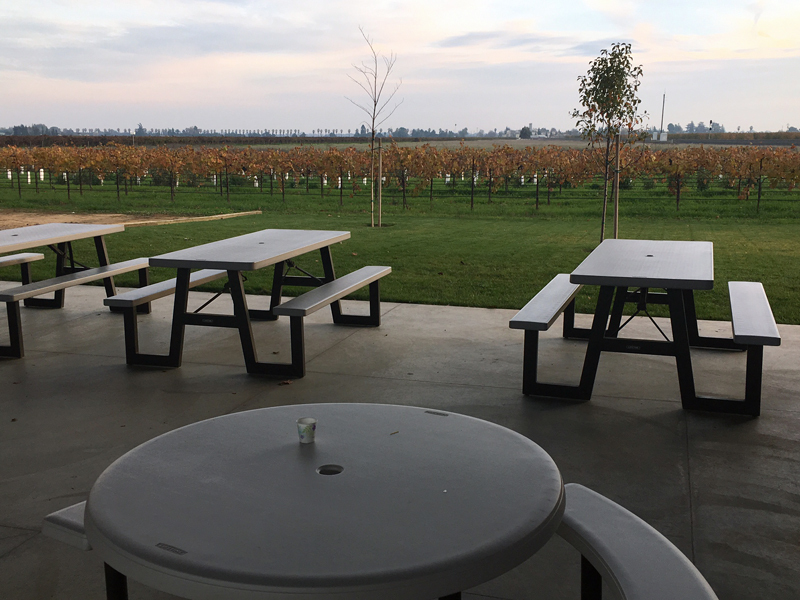 The cold temps and wind had picked up and it was nice to have the option to hangout in the tasting room… although the outside seating area would be nice in the spring and summer months, especially for the concerts. We started off with the 2015 Viognier, which retails for $18/bottle. Description: Lush tropical flavors of pineapple and mango with a touch of banana for a smooth feel and creamy finish. We all liked it, but ended up liking the other pours more. Light mineral notes, with a soft, tart berry finish. The earth and vine truly shine through from this Carneros fruit. This pour was my favorite of the day. One of my goals for 2017 is to taste/drink more wine. Haha. I definitely know much more about food tasting than wine tasting and some friends have recommended some local classes and places for me to learn more. I don’t ever see myself getting crazy with wine, I just would like to learn more about wine/food pairings and find a few bottles I like along the way. I tend to lean more towards sweeter wines, but I’m starting to appreciate a wider range. I’ve been told the “sweet’ thing comes from inexperience – LOL… mostly by wine snobby people in the industry. My close friends (lots of wine lovers) don’t care what I drink or that I sometimes prefer my red wine chilled with a single ice cube. Oh relax… everything is going to be o.k., like I said – the goal is to learn more, not to be a wine #knowitall. A blend of two Zinfandel vineyards that starts with bright, tart currants and finishes with smooth notes of cocoa. A true everyday Zinfandel. My iPhone notes said that this one ranked in our top 3. From the Soucie vineyard planted in 1916. Bing cherries with a cola quality in the mid palette. Smooth and vibrant with a lingering finish. We all liked this one. Juicy plums and blueberries with a light smoky cedar middle and peppery finish. I did taste the smoky cedar, but preferred some of the others more. 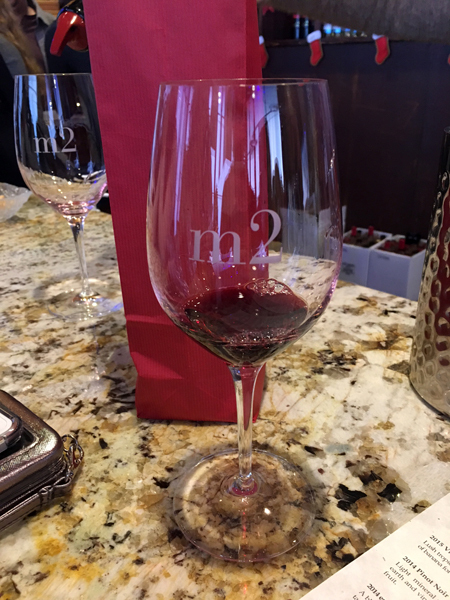 The last pour of the day was the 2013 Trio Red Blend – $24/bottle. A blend of Cabernet Sauvignon, Syrah and Petite Sirah. Sweet cherries with hints of chocolate, cloves and spices. Another favorite of the day. 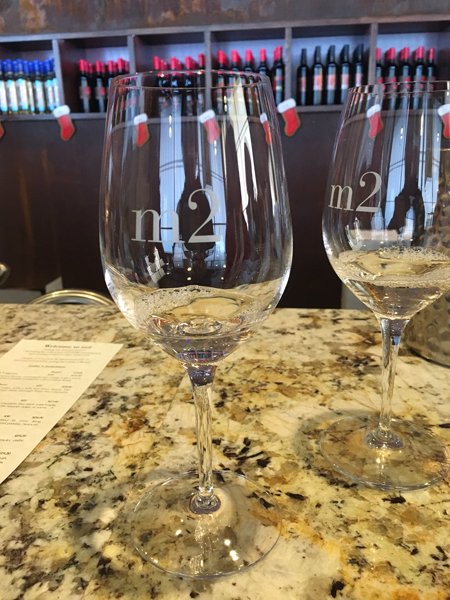 I’m looking forward to many more days of wine tasting in Lodi and surrounding areas. With it being such a short drive from Sacramento – it’s worth exploring. I have a few other friends that belong to Lodi wine clubs and I look forward to trying their favorites as well. Thanks again Wendy for playing tour guide and for introducing me to m2, I’m certain I will be going back to explore more.